My mum wanted lace and I wanted sequins. I had this Rizalman design in my head. Plain white top with a sequin sarong. Then, we found sequinned lace! It was perfect for us as that meant we both got what we wanted. Except, you know, I made the lace into a skirt. When my grandmother saw the dress, she was quite horrified as she could not fathom what could have possessed me to make such a 'weird' choice. But I had my reasons, which I will share with you now. Firstly, I am 20. It's prada lace. No way am I going to use it as a top. That would make me look twice my age as the texture is hard and the flowers are big and rather bold. I wanted something soft to match my youth. Secondly, the veil is going to be heavy. I need to find a middle ground. 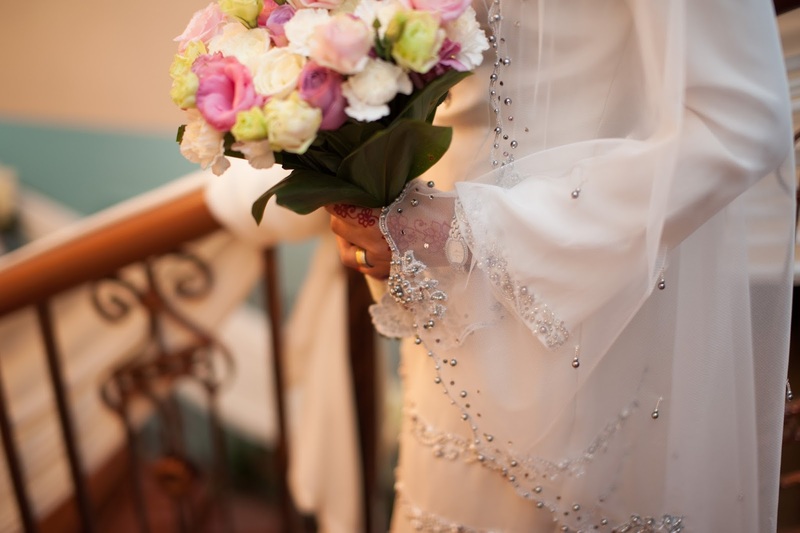 Most of the times, brides have a mess on the head and body but their sarong? Plain. So what I did was to allow heavy beading and patchwork on my head and below my knees. However, it is evenly laid out with the almost plain top. Another reason I wanted a plain top is because I wanted to wear all the jewels that I could get my hands on. Who wouldn't love to wear a few diamonds here and there. However, the tailor added beads at the neckline and that prevented me from wearing any necklace. But it turned out prettier than I imagined. 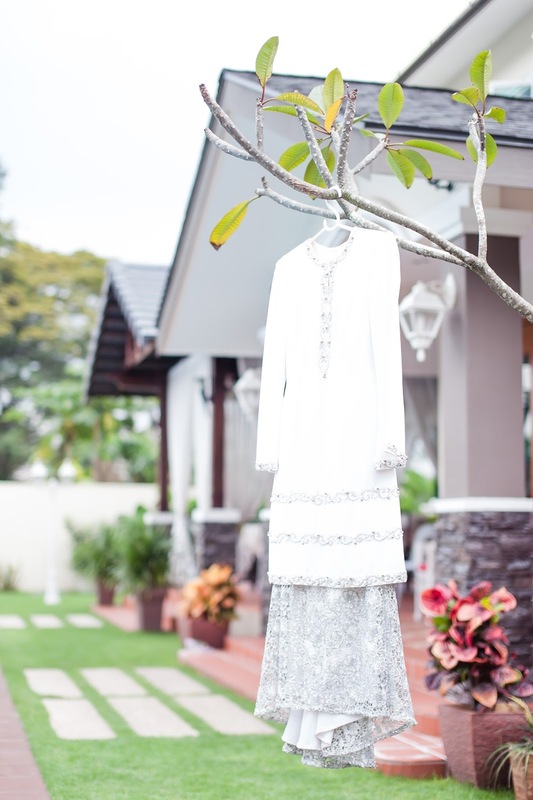 I had the dress made at Shan-Lyn, a well known seamstress in Ipoh. If you're wondering why I didn't go for designer, it's because I already had a design in mind. When I go to designers, I need them to design for me. 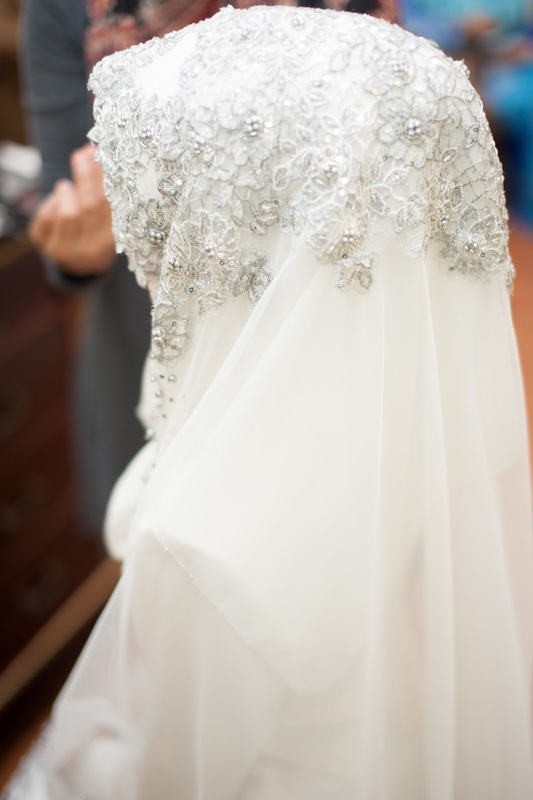 My style tip for all bride-to-be out there: Be comfortable with your dress. Be you. 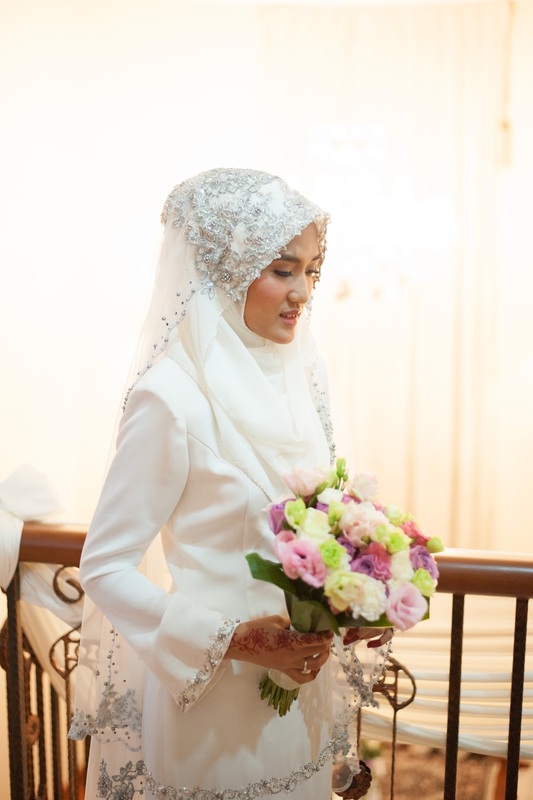 Some people love the whole lengthy dress or veil. I, for one, felt lengthiness to be a nuisance. Some people like to wear the tudung sarung but I would look round and unflattering in those. If you notice, I wore the exact same style as my daily hijab style. It works for me. Find something that works for you. 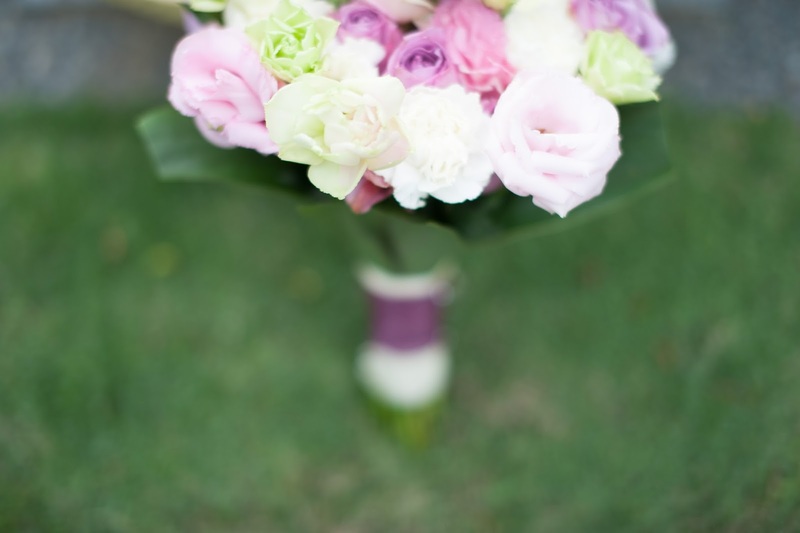 But most importantly, one should be confident in your wedding dress. If you don't feel it, don't do it. There are billions of designs out there, get one that screams you. That's what I did, and I love my dress. Another plus side of my dress, is that I can wear the top and sarong again, separately. It will not go to waste! I love that fact. The sarong is really a sequinned lace skirt. Smart, right? That's what I wanted all along. Hehe. While the dress was a piece of cake, finding the perfect MUA was no easy task. I had gone through the portfolios of many MUAs. The problem for me was really that I wanted a woman as my MUA. Most people recommended male MUAs which I was reluctant to get. 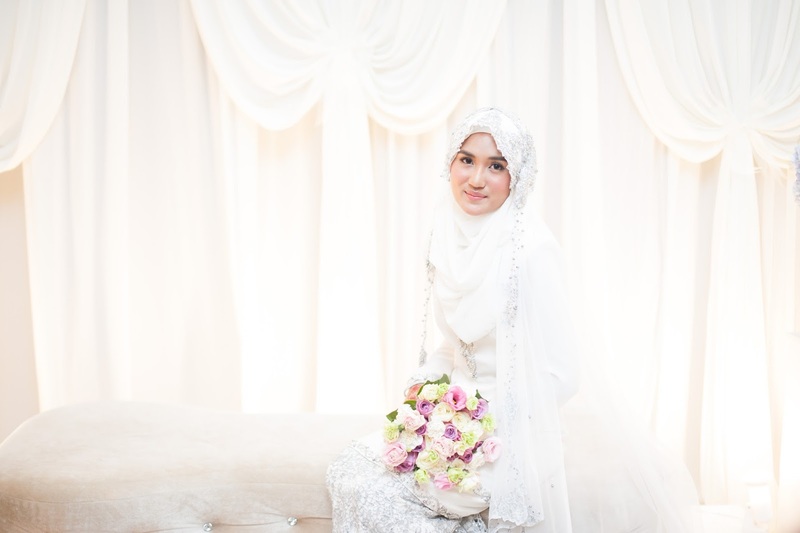 Another reason why finding the perfect MUA was difficult is because the wedding is in Ipoh. And these KL MUAs charge a fortune for that! I know, most people will tell you to spend on the MUA because that's your face! But if the MUA is more expensive than your dress, I would suggest you not to do so. Find an MUA that can understand you. The test make-up session is very important. She/He does/t have to be famous. But she/he has to be right for you. My MUA match made in heaven is CHARMS by Anna Cherie. I cannot explain the feeling I had the moment I saw her portfolio. I texted her instantly and booked her on the spot! I kid you not. I loved that she did natural make-up. I loved that she could make a young girl remain looking young even with make up. I loved her! I wanted the Kate Middleton look. The one at her wedding. And I felt like I got that look for both the solemnisation and reception. It was worth it! My sister (Maid of Honour), Anna Cherie (MUA) and me as I got ready. I have no idea why it's taking me so long to post about the wedding. Ok. No. I do know. It's our wedding. It's not easy for me to talk about these 3 days because it's my once in a lifetime event. I can't talk about it without thinking about everything that follows. Marriage is a journey. And so was getting to this stage. A long, bumpy road. 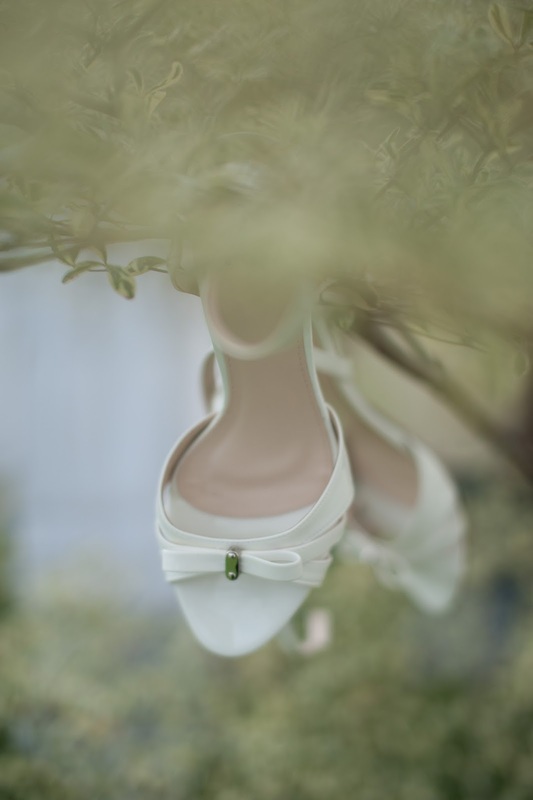 I cannot write about the wedding without feeling all I felt then. I am trying to slowly release these emotions to share these moments with all of you. Hope you had a good read. Will release the whole story of the solemnisation soon, with lots and lots of pictures! On the pelamin, waiting for my prince king.